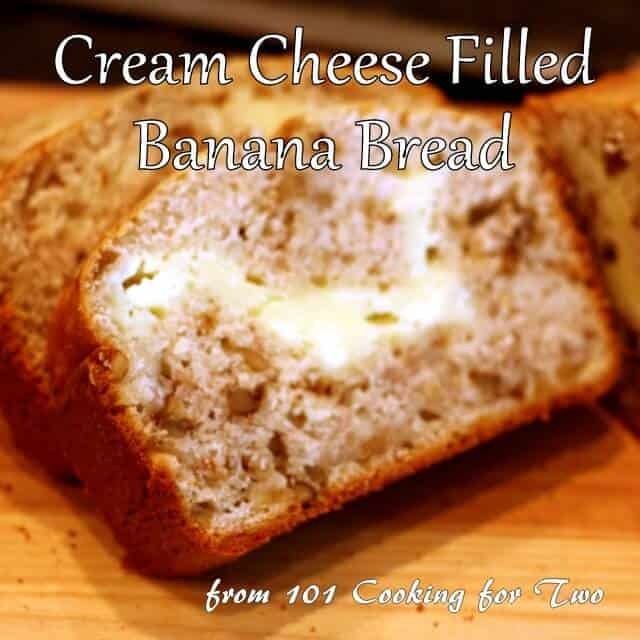 Cream Cheese Filled Banana Bread just sounds great. 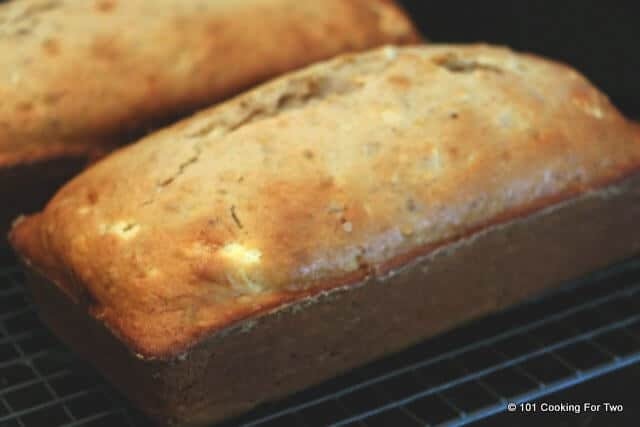 Take a great banana bread recipe and kick it up a notch with a layer of cream cheese for extra taste and moisture. Several version of this has made the internet rounds recently, so I just had to try it. Now I’m picky… very picky. I love my old fashion banana nut bread. Nothing else will do but I’m willing to buff it up some, and I do love cream cheese. So my plan. I would use my banana bread recipe but make two smaller loaves. I usually make a single very large and tall loaf but adding more height with the filling just would not work. So spread in into two pans, more like most people make banana bread and cut back the cooking time some. A five mainly because the banana bread is a 5. The banana flavor overwhelms the cream cheese some. Notes: Due to the cream cheese, the old toothpick method of checking for done does not work well. Watch the edges for dark brown. Allow 8 oz cream cheese to rest at room temperature until softened. 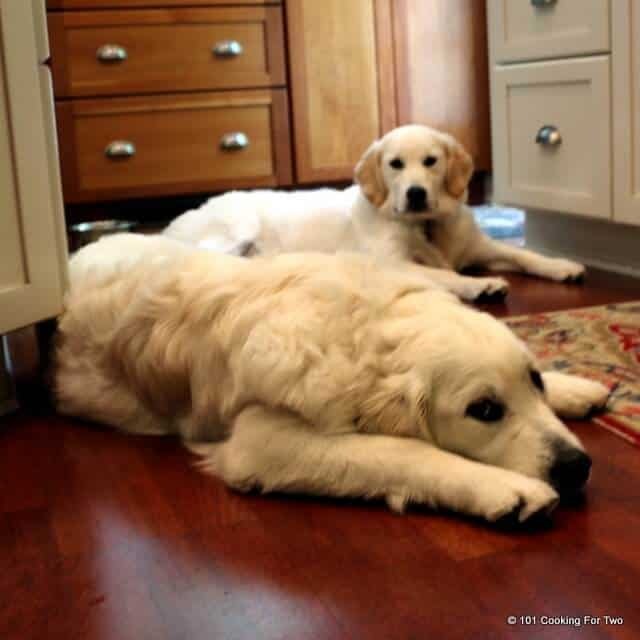 Preheat the oven to 350, not convection. Grease and flour two four by eight loaf pans with a tablespoon of butter and a little flour. In a large mixing bowl mash 2-3 over ripe bananas. 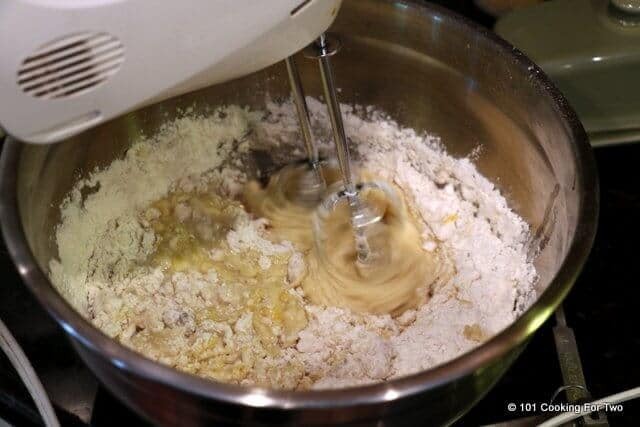 Add 2½ cup AP flour, 1 cup sugar, four teaspoon baking powder, one teaspoon salt, three tablespoon oil, ¾ cup milk, one egg, 1 cup chopped walnuts (optional). 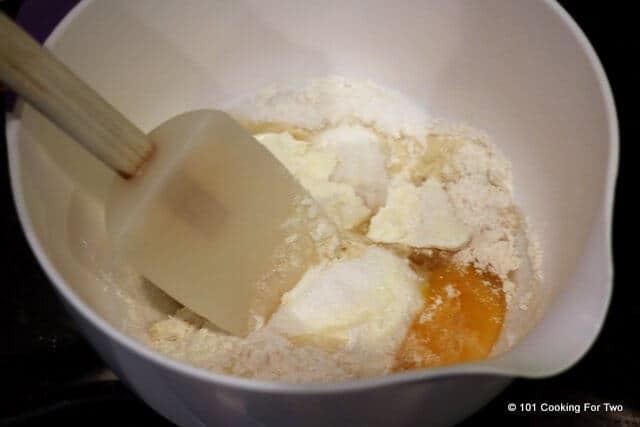 Beat at medium speed with a hand mixer for 1-2 minutes occasionally stopping to scrape sides to be sure to incorporate all the ingredients. Mix the cream cheese filling. Combine 8 oz of softened cream cheese with 1/2 cup sugar, 1/4 cup flour, and one egg. Mix until almost smooth. Transfer 1 3/4 cup of the banana mixture into each floured pan. Spread the cream cheese mixture evenly over each pan. Then top with the remaining banana mixture. Bake for about 45 minutes until edge is browning well. The toothpick method may not work well due to the cream cheese. 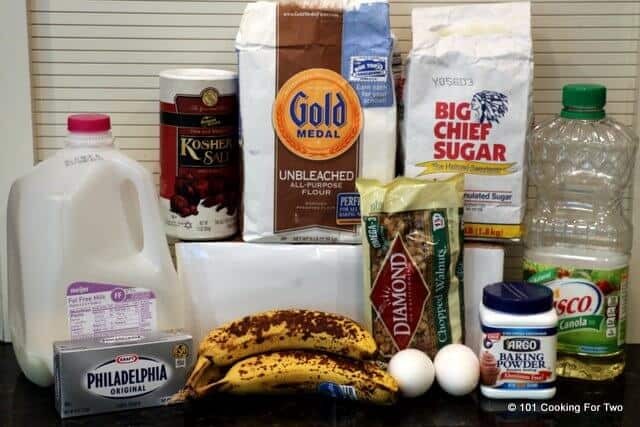 Cream Cheese Filled Banana Bread sounds great. 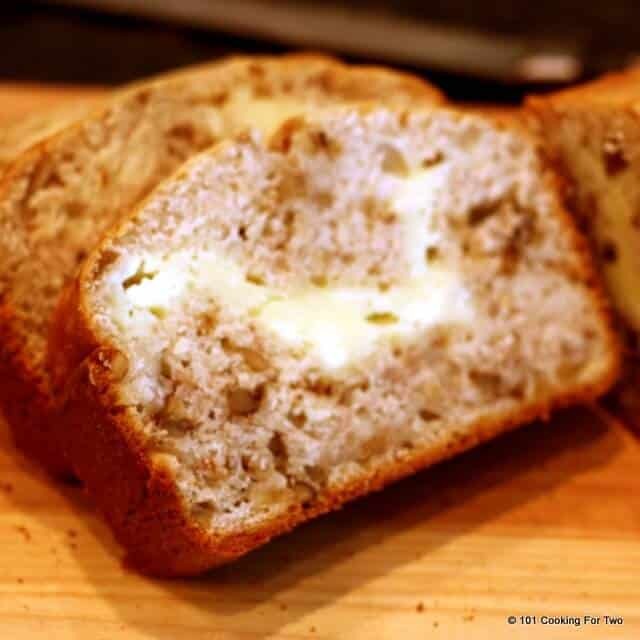 Take a great banana bread recipe and kick it up a notch with a layer of cream cheese for extra taste and moisture. In a large mixing bowl mash 2-3 over ripe bananas. 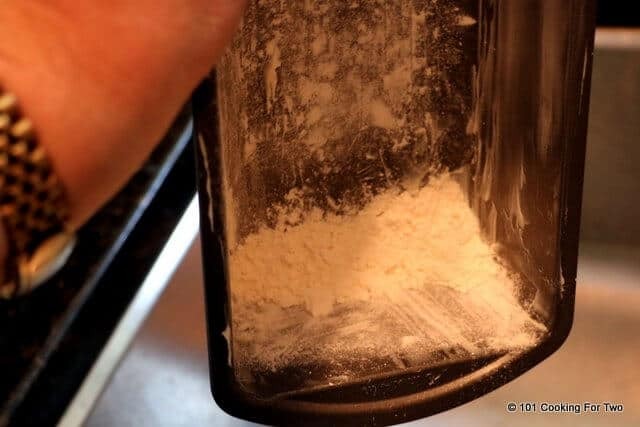 Add 2½ cup AP flour, 1 cup sugar, four teaspoons baking powder, one teaspoon salt, three tablespoons oil, ¾ cup milk, one egg, 1 cup chopped walnuts (optional). Several have complained of not much banana taste. The bananas must be over ripe. If you bananas are yellow, you won't be happy. I used extra bananas and was still very thick and no taste!!! Will not make again! Having to toss it all no one will eat it! 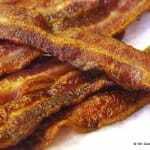 Hey can I substitute the oil with butter ? 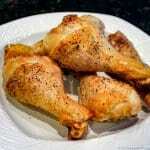 It should be fine but butter is not all oil so for the 3 tablespoon of oil use 4 tablespoons (1/4 cup) of butter. Bland recipe. Definitely needs more banana and cream cheese layer doesn’t taste like anything. Won’t try again. 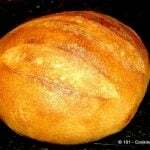 I just made this bread tonight. It wasn’t bad, but I would definitely tweak it a little for next time. I would add vanilla and maybe one more banana. Also, instead of milk, maybe yogurt. The bread wasn’t very moist, in my opinion. Also, the banana taste just wasn’t enough for me. J expect banana bread to taste more like bananas. The cream cheese part was pretty good though. I might add a little vanilla to the filling next time too though. Not my favorite recipe. Will have to try a different one. 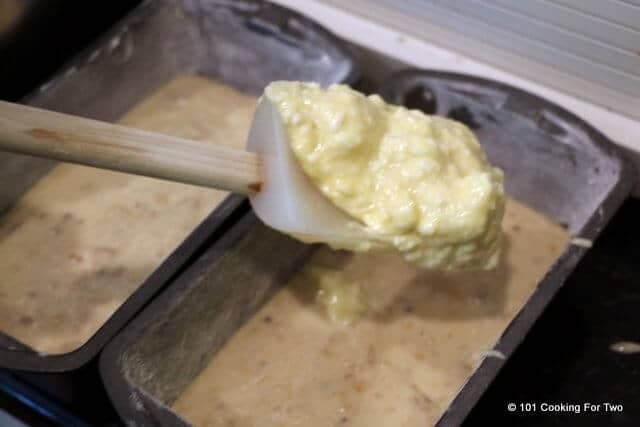 Making this now…currently in the oven and I can say that in tasting the cream cheese mixture it needed a little vanilla and I had a hard time getting enough batter to cover the cream cheese for 2 loaves. I think the measurement for the bottom half of the loaf should be less, so there’s enough for the top of the loaves. Perfect !!! This bread is amazing !!!! Will be making it again.. I ended up leaving it in the oven for 1:25 minutes. I was worried the cream cheese wasn’t baking. How is it suppose to look? The toothpick method does not work and if you try it will look like the cream cheese is not cooking so this one is by time and look at the edge like the picture. Hope that helps. Just made this I used a little more banana than called for since I had a lot of over ripe bananas and it turned out perfectly in a bundt pan rather than 2 loaves. I will probably add more sugar next time and I forgot my touch of vanilla I always add to my bread so will definitely add that as well. Overall delicious though. This was a great recipe!!! I should have put it in two pans but I only had the bigger size. Will definitely make this one again…for people saying they had problems, remember that your altitude will determine the outcome and you would have to adjust temperatures and ingredients. My only other problem was that it was sweeter than I needed, but that’s because my bananas were VERY ripe. It was a hit in my house and I look forward to making it again! It wasn’t the wow factor but I almost ate one of the whole loaves. It wasn’t as sturdy as I thought it would be either but overall it was really good. This seems to be very up and down. Thanks to all the the comments. This recipe was perfect. Although I added 2 tbsp of vanilla and 2 tsp of cinnamon. After reading the reviews, I was hesitant to use this recipe. Just made the bread and it smells great. Tried an end piece of the bread while cooling and it is delicious. Thank you for a wonderful recipe. I thought the bread thick and not much flavor, seems like to much flour and not enough taste from the cream cheese. 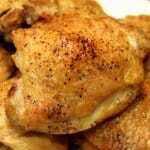 I have used other recipes and the flavor and taste was perfect. I will not use this one again. Perfect recipe. No problems with it at all, family love it. I am going to slightly increase the amount of sugar next time, but the recipe was great and I will cook it again. I need to get smaller loaf pans to make it work better. 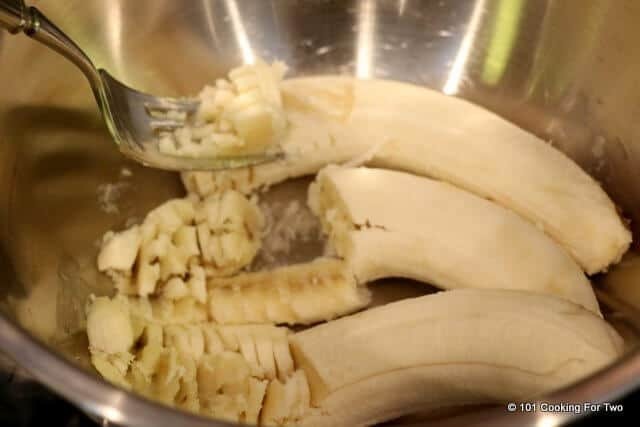 I was madly scraping the banana mixture in order to have enough batter for two loaves. Thanks for the rating and comment. I could see a touch more sugar. The more ripe the banana, the less sugar. 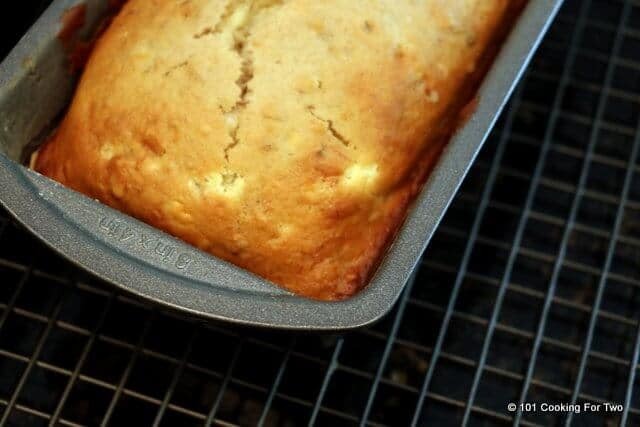 I usually do my banana bread in one large pan… I like it tall. But here I needed to spread the filling over two pans.